A few months ago, I decided to try and limit my bread and pasta intake. AKA, I can't remember the last time I had a sandwich. Weeeeelllll, if you don't consider these Hawaiian Pork Sliders a member of the sandwich category. Or the french bread with meats and cheeses that I stuffed in my face while wine tasting on Saturday. I suppose that bread-meats-cheeses is a deconstructed sandwich. Scratch that "I can't remember..." comment above. I had my last sandwich on Saturday. Bottom line, I am trying to fill my stomach with foods that provide my body with lots of good energy -- lean protein, fruits and vegetables. I feel better eating this way. Pizza isn't a common food occurrence in our house so this recipe was a nice, still healthful, treat. It was also a quick, vegetarian dinner for a weeknight. We had big bowls of delicious salad before said pizza and I limited myself to a serving size, which you may be surprised to find out is not half of the prepared pizza. If using pizza dough, prepare according to package instructions. Combine the olive oil and minced garlic in a small bowl. Brush over the crust. Sprinkle mozzarella evenly over the olive oil and garlic sauce, leaving a 1/2-inch border around the edges of the crust. 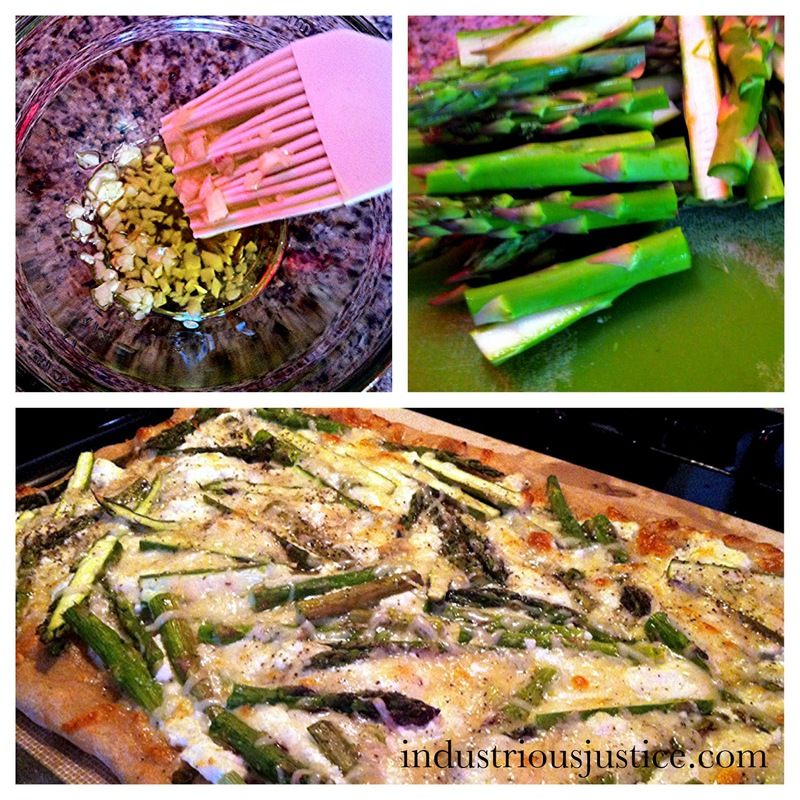 Top the mozzarella with an even layer of asparagus, goat cheese and parmesan. Sprinkle with black pepper. Bake for 12-15 minutes, until crust is browned around the edges and the cheese is bubbly and just starting to brown.